Traditionally, baked beans are more of “summer” oriented dish, but to me, they’re the perfect side to compliment the declining temperatures and fading colors of fall. 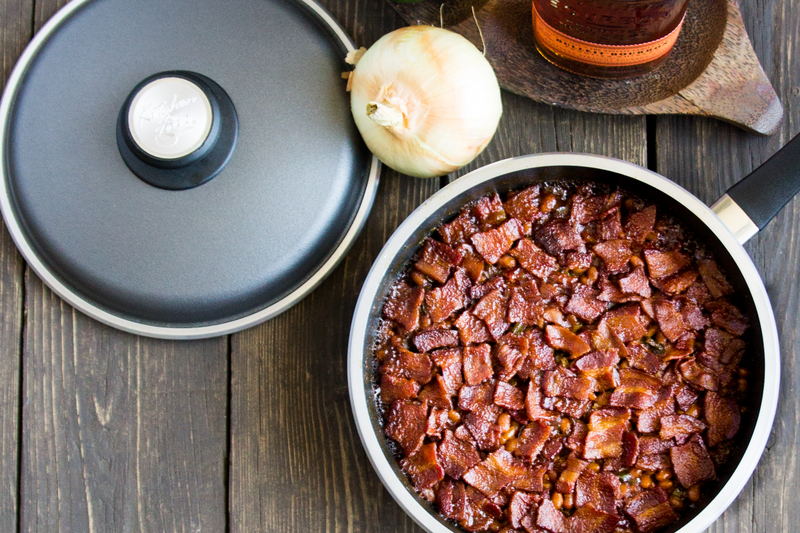 So whether you’re looking for a classic bbq or tailgate dish, or you’re looking to add a little fire-water tinged goodness to your holiday meals, this bourbon baked beans recipe is the perfect choice. – Heat a 10″ Saute pan over medium heat. Cut bacon strips into 1″ pieces and cook until nicely browned but not burned. – Remove the cooked bacon, placing on a paper towel to drain and leave about a tablespoon of the rendered fat in the pan. Add the onions and bell peppers to the pan and cook over medium heat, stirring occasionally until onions are translucent. – While onions and peppers are cooking, combine ketchup, barbecue sauce, brown sugar, mustard, Worcestershire sauce, Bourbon, garlic and pepper in a medium-sized bowl and mix well; set aside. – Drain beans and add to the sauce mixture, stirring gently to combine well. – Reduce heat to low and add the mixture to the pan with the onions and peppers. Stir again to combine well. – Cover the top of the beans with an even layer of crispy bacon bits, then cover and allow to simmer for approximately 20-25 minutes or until liquid is reduced by half and sauce has become thick. – Remove from heat and serve immediately.